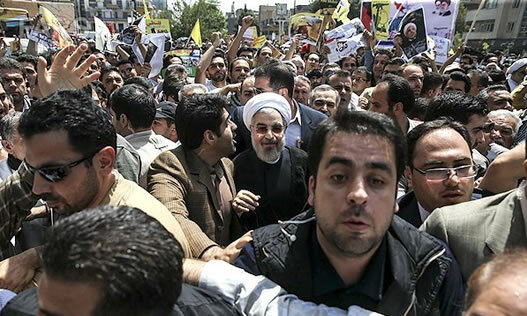 Iranian president Hassan Rohani and his government were targeted with insults and attacks in the demonstrations of final Friday of Ramadan being held across Iran. Iran’s late founder Ayatollah Khomeini initiated the custom of staging demonstrations on the last day of Ramadan in support of Palestine naming the day Qods Day. This year the demonstrations became a forum to attack recently re-elected President Rohani. Following the lead from Iran’s Supreme Leader Ayatollah Khamenei who has recommended the policy of “fire at will” against enemies, conservative clerics leading these protests across the country insisted on the “Death to America!” slogan and slammed President Rohani for suggesting that the so-called “Death to…” slogans are no longer appropriate. ILNA’s coverage of the news was entitled: “Blatant Insults to the President at Qods Day Demonstrations”. The demonstrations across the country received wide coverage by state media stressing the insulting content of slogans delivered against the president, his cabinet and even against late moderate cleric Ayatollah Hashemi Rafsanjani. Hassan Rohani’s cabinet members have made every effort to steer away from Ayatollah Khamenei’s edict to “fire at will” and have attempted to reduce its impact by saying, what is evident is that our leader does not want any interpretation of his words to challenge the rule of law and order in the country. Jahangir Eshaghi, Rohani’s vice president and Ali Motahari, outspoken Tehran MP who has consistently challenged the house arrest of Iran’s opposition leaders and condemned violent attacks by the country’s conservative factions on adversaries, were two of the top targets of “Fire at Will” crowds on Qods Day events. Reports on ILNA indicate that a number of demonstrators would launch into loud “Death to…!” slogans as soon as cabinet members were sighted. The landslide victory of President Rohani in the elections which confirmed the country’s demand for moderation in politics, has triggered a backlash among ultra conservative factions of the Islamic Republic who have apparently been given a green light by the country’s supreme leader Ayatollah Khamenei.